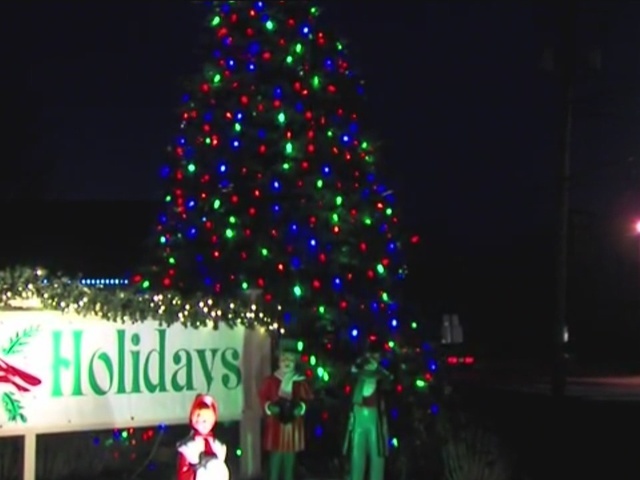 Police in Richfield want to know who tried to cut down the village Christmas tree. The 20 foot spruce, which sits at the corner of West Streetsboro and Broadview Roads, had a huge gash in the trunk, from which it likely won’t recover. By first appearances, it’s impossible to tell anything is wrong with the tree, but lift up the lower branches and the extent of the vandalism becomes clear. Richfield Village arborist Brad McKay showed how someone apparently crawled underneath the branches and tried to chop down the tree. “It looked like it was done with a bow saw that you would pick up at any place you cut down a tree, or Lowes or Home Depot,” McKay said. Village officials noticed the damage while they were getting ready for last week’s annual tree lightning. It’s been a holiday tradition for about the past decade. There’s no telling when the damage actually occurred. “Somebody could have been under there for an hour and it would be very hard to notice,” McKay said. Police Chief Keith Morgan said there was no video of the incident and there are no suspects. “That’s why we’re offering a reward for anybody that can give us some information that would lead to the arrest or conviction of whoever did it,” Chief Morgan said. That’s especially because the cut is so severe, McKay said, the tree will soon die. “I wish it wouldn’t have happened,” McKay said. Once the holiday season ends, there are talks of potentially planting a new tree either in the same spot or somewhere else. Richfield Police are offering a $500 reward for information that leads to an arrest and a conviction. Contact the department at the non-emergency line at 330-695-9500 or, if you prefer to remain anonymous, contact the tip line at 330-659-2850.